Hi-tech Estates and Promoter Pvt Ltd is a leading name in the field of real esate, construction in the temple city Bhubaneswar, Odisha. This company is managed by the experienced leaders Mr. Tirupati Panigrahi and Mr. Tirupati Chowdhury to provide affordable housing projects to their customers. This company was started with 5 projects such as Puspanjali Enclave, Kalyan Vihar Phase I, Kalyan Vihar Phase II, Bhagya Nagar and Brundaban firm house (Near batamangala, Puri, Odisha). This company is also active in education sector. This company has started an engineering college named KIST under Vidya Sagar Charitable Trust situated at Jatni, Bhubaneswar and one private medical college with hospital (the first private medical college and hospital of the state Odisha). This company has highly educated professionals to deliver quality services and 24x7 customer supports. This company is associated with Rajdhani systems and estates pvt ltd to grow the construction business. This project is located at Near CIFA, Matiapada, Bhubaneswar, Odisha. This project is a distance of 2kms from KEC (Krupajala Engineering College) and BRM College, 8kms from Ravi Talkies square, 9kms from Airport, and 12kms from Bhubaneswar Railway Station. The Installments facilities are available on this project with easy home loans from leading banks. This project is at Near Batamangala, Puri, Odisha. This project has all types of modern facilities with 800 flats. This project is situated at Parlakhemundi, Gajapati, Odisha and very close to Bus stand, Police station, Post office, Railway station, Central school, Navodaya Vidyalaya, Police training center and State highway. This project is very near to Maharaja Krishna Chandra Gajapati Palace and close to JITM University. This project is at Bhadrak, Odisha. This project is a distance of 3kms from railway station, 4kms from bus stand, 2kms from Xavier high school, 6kms from Bhadrak College, 1kms from Charampa College, 3kms from Charampa High school, and 6kms from hospital. This project has 800 flats with 1BHK, 2BHK, and 3BHK. 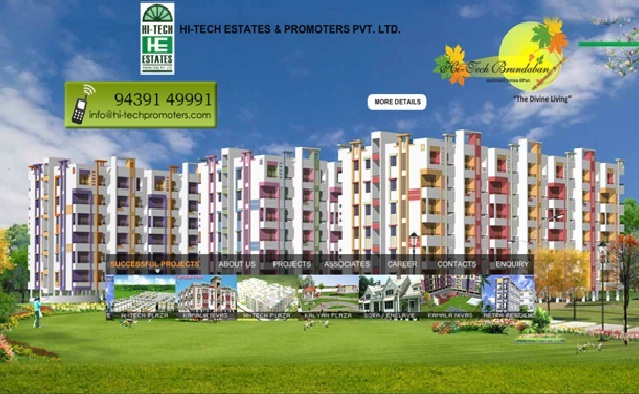 This project is located at Near to Hi-tech Heaven Project, Bhubaneswar, Odisha. This project is near to Airport, railway station, and surrounded with many Government and Private Institutions. This project is of 1BHK and 2BHK flats with all modern amenties. This project is located at Gudia Pokhari, Bhubaneswar, Odisha. This project is near to the project Hi-tech Heaven and adjacent to NH-203, covered the area of 1 acre with 2BHK, 3BHK flats with all modern facilities. This project is located at Vishkhapatnam, Andhra Pradesh, India. This project is a mega residential complex in Vishkhapatnam, near to the airport and railway station. This project is also coming with 2BHK and 3BHK Flats with affordable prices. This project is mainly located at the opposite of Sujatha Nagar ARCH. This project is at Phase I, II, III, Sundarpada square, Bhubaneswar, Odisha. This project is also coming with 2BHK and 3 BHK apartments with cheap prices. This project is a distance of 2.5 kms from DAV School, Pokhariput, 2.5 kms from Lingaraj Railway Station, 3kms from Airport, 6kms from Rajmahal Square, 8kms from Bhubaneswar Railway Station, and 8 kms from Bhubaneswar City Bus Terminal. This project is located at Sundarpada square, Bhubaneswar, Odisha. This project is nearer to city with a distance of 8 kms from Bhubaneswar Railway station, 8kms from city bus terminal, and 3kms from airport. This project is very nearer to the projects Hi-tech Plaza, Kalyan Plaza.